Although most of the modern guitarists consider the guitar pedal board to be the standard part of their equipment, that wasn’t always the case. Have in mind that the first modern guitar was built back in the middle of the 19th century and the first mass-production electric guitar was produced 100 years later. Of course, in the beginning, guitarists didn’t use any pedals or effects – they would just attach the guitar to the amp and that was it. We had to wait a few more decades until the ’70 when the first modern pedals were built. Click Here to Jump to The 10 Best Guitar Pedal Boards. 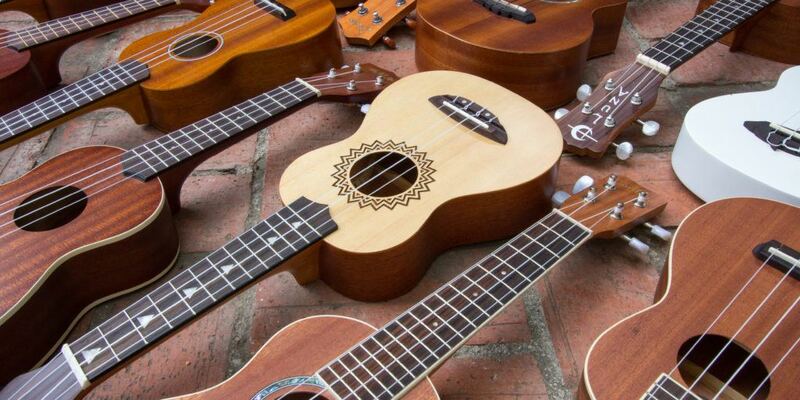 At first, guitarists didn’t have many pedals to choose between. They mostly used OD, wah, and maybe the fuzz pedal. Here you can see that Jimi Hendrix used only a few pedals, even though he was considered to be the best guitarist at the time. However, later on, more and more effects started to appear. In the ’80, a lot of guitarists used pedals such as flanger, chorus, delay… So, since this period, things became more interesting – guitar pedals kept evolving, so very soon you could find every effect pedal that you can think of. Today there are numerous pedals to choose between – volume pedal, compressor, looper, boost pedal, tremolo, EQ, noise-gate, octave, vibrato, harmonizer, whammy… Virtually anything you can think of has been made. Why Use a Pedal Board? As we started to use more and more pedals we faced one practical problem. We had to take all of these pedals to the gig, to attach them, and to detach them afterward. Now, this is not a problem when you have just a few pedals, but it is very irritating when you have 10 of them! This is very impractical, as you can easily damage your pedals during the transport. Also, you need to spend some time before and after the gig in order to arrange them and to pack them later on. This is why guitarists came to the idea to somehow fix these pedals on a platform and to overcome these issues. And thus, the pedal board was born. Too Many Pedals? Put it On a Pedal Board. There are different kinds of guitar pedal boards, but they all have the same function. You can connect your pedals and fix them on it. This way, you only have one item that you can carry in a bag. When you come to a gig, you just unpack it and connect it to the amp and that is it! Another problem that you’ll face if you put your pedals directly on stage is that they will move around when you step on them. When you press the pedal a couple of times, it can easily get out of the line and thus, move other pedals as well. Not to mention that this way you can detach pedals from each other and cut off your guitar signal. Of course, the pedal board is a solution for both of these problems. Pedals will be fixed and won’t move even if you are not very gentle with them. If you have a lot of pedals, you probably had some troubles when it comes to arranging them. If you try to put all of them in the straight line, it will be too wide so you’ll have to make a step or two before pressing the pedal. If you put them in rows, it will obviously be very hard to reach all of them. Like in the previous case, the pedal board is the solution. The platform on the pedal board is made at a certain angle so that you can easily reach any pedal you want. Of course, besides the pedals, you also have to ensure the power supply. Without the guitar pedal board, you’ll have as many adapters as pedals. So, putting all of this together is a pretty complex process that can last forever, especially when you are on stage. Fortunately, the guitar pedal board has just one power supply that is enough for all of the pedals (usually around 8 pedals per one power supply). And not just that, but once you attach your pedals to the power supply you don’t have to detach them afterward – just detach your guitar and put the guitar pedal board in the bag and that is it! As you can see, there are numerous benefits from using the pedal board. If you have more than 3 or 4 pedals, the pedal board is an absolute must-have! The problem is that many guitarists (and especially beginners) can have a hard time when it comes to choosing the right pedal board. Although pedal boards are very similar, each one of them has some specific elements. Let’s take a look at the most important things that you should consider when buying the pedal board. As you are probably aware of, there are numerous kinds of pedal boards. This makes perfect sense since there are also a lot of guitar players with different preferences. Dimensions are arguably the most important factor (or at least, the factor we pay the most attention to). You need a guitar pedal board on which you can put all of the pedals that you plan to use. It can be the best pedal board ever, but if you have to put some of the pedals aside then it doesn’t serve the purpose. Of course, you also have to consider the pedal dimensions, space between the pedals, cables, power supply, etc. 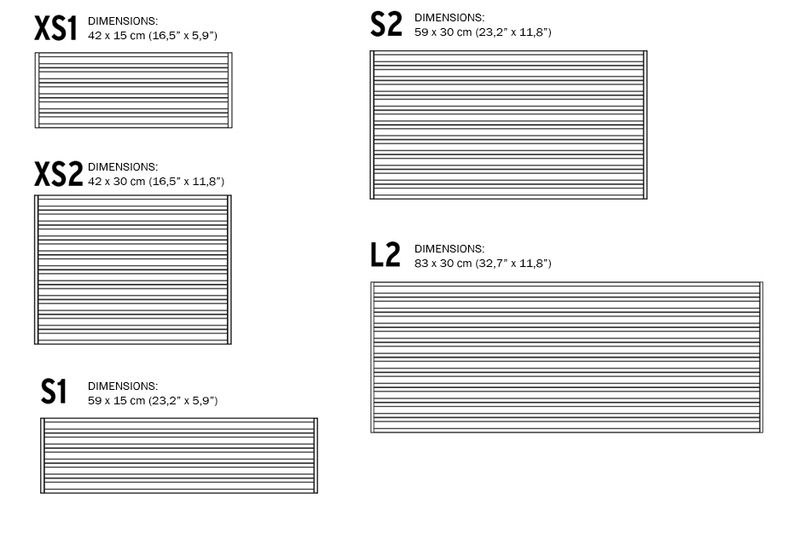 As you can see, these dimensions vary a lot. So, pay close attention when it comes to this. Some people buy too large pedal boards and use only a few pedals. And vice versa, others get a small pedal board only to realize that they need more pedals that can’t fit. I am a professional musician who also works as a guitar teacher, so I have the privilege to spend time both with professionals and beginners. In my experience, professionals and experienced players rarely add more pedals to their pedal chain. When you play for a long period of time, you get used to your sound, so the experimentation with new sound is rarely the case. If these guitarists get a new pedal, it is usually similar to the one they already have, so they just switch them. On the other hand, beginners tend to experiment a lot. They are not really sure what kind of sound they want and thus, they don’t know how many pedals they really need, so they can often make huge changes. 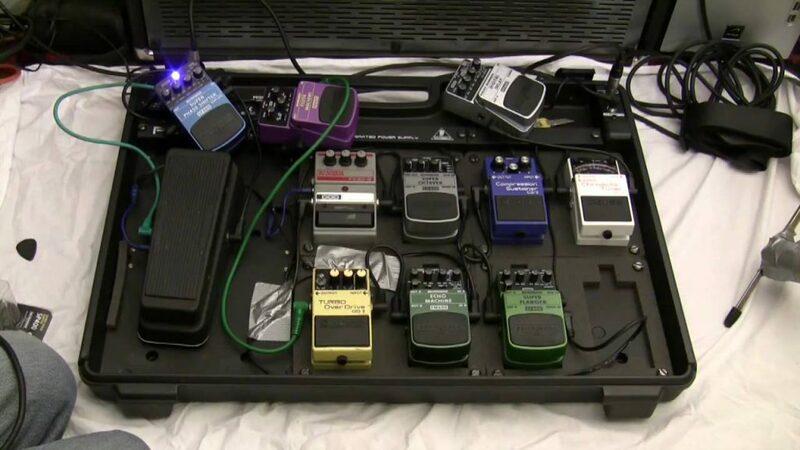 Having this in mind, I believe that the best advice is that, if you are a professional, you should get the guitar pedal board on which you can fit your current pedals and effects. You most likely won’t change it radically in the near future. However, if you are a beginner, you probably have only a few pedals. Considering the fact that you are going to learn new things and will try to improve your sound, I think that getting a little bigger pedal board than you currently need is not such a bad idea. You will probably get an additional pedal or two, so it’s better to get a bigger pedal board now than to soon spend more money on a new one. Another important factor is the material that the pedal board is made of. The majority of guitar pedal boards are made of aluminum alloy or plastic. Some of them are made of wood, but they are often too heavy and impractical. Both the aluminum and the plastic are fine. Of course, aluminum is more solid and usually heavier. However, if you take care of your pedal board, it doesn’t really matter whether it’s made of plastic or aluminum. Although the bag is not the element of the pedal board, it is actually extremely important because it serves as the main protection. When you are traveling to a gig, the bag is that element that protects your pedals from damaging. All of the pedal boards on our list below come in a bag. Some of them are more solid than others. If you don’t plan to spend additional money on a bag, you should also take this factor into account. In the case you don’t plan to carry your guitar pedal board around, than any kind of a bag will do the job. On the other hand, if you will spend a lot of time in a van traveling from one place to another then you should better get a solid bag. 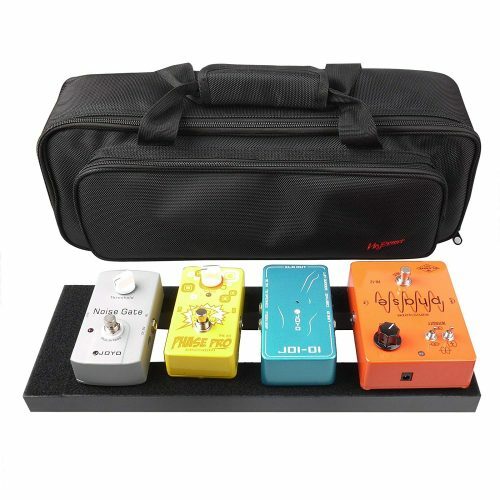 Besides bag, almost all of the guitar pedal boards on our list include a couple of accessories. The most important one is the power supply; however, only two pedal boards from the list come with the power supply. Of course, you can buy this element separately (we will discuss this issue later in the text). The usual accessories packet include zip ties, cables, and plastic straps. Although these are not expensive and are easy to find, it does help when you don’t have to look for any additional elements, but can just plug in your guitar and start playing. Vangoa pedal board is definitely one of my favorites. It is a very interesting pedalboard with a great package list. Made of aluminum alloy, this pedal board is very solid. Another great thing about its construction is that it is also very light (3.3lb). Its dimensions are 19.8″ x 11.5″, so you can put around 8 pedals on it. Now, I should mention one important thing considering the number of pedals that can fit on the pedal board. It all depends on the size of the pedal. For example, there are very big pedals, such as Line 6 DL4 Delay Modeler, and small ones, like micro looper; so, obviously, the smaller the pedals are, the more you can put on the pedal board, and vice versa. One thing is particularly interesting about Vangoa. Like the majority of pedal boards, the platform on this one is at a certain angle. However, the cool thing is that you can change this angle and put it in a horizontal shape just by pulling up two little “legs” at its ends. So, this leaves you with the possibility to choose between two kinds of position which is very pragmatic. There is a plenty of space below the pedal board, so you can place your power supply there. Another thing that surprised me is the included accessories. You’ll get three short cables that are used for attaching pedals to one another. These short cables are very practical because you won’t have cables all over the pedal board which is the case when you use longer cables. You will also get zip ties and little plastic straps to fasten your pedals. And of course, the pedals board comes in a bag. The price is around $60, which is a fair deal, having in mind the quality of the pedal board and all of the accessories that you’ll receive with it. This is a great guitar pedal board for both beginners and professionals. High-quality material, very practical, and a lot of additional accessories. Also, you can change its angle to make it fit your preferences. Donner is the prototype of a pedal board. When you think of a pedal board, you will probably imagine something like this. It is made of aluminum alloy so it is very resistant. If you use it in the proper way, it can basically last forever. The cool thing is that, besides being solid, this pedalboard is also very light, so you won’t have problems when it comes to carrying it around. This can sometimes be a big issue, especially in the case of larger pedal boards – some of them can be really heavy! If you add the weight of the pedals, it is clear that the transport can be pretty tricky. The dimensions of this pedal board are 20” x 11.4” x 4’’, so it belongs to the category of middle-sized pedal boards. You can easily put around 10 pedals on it. If the pedals are smaller, this number is even higher. Honestly, I believe that you won’t need a larger pedal board than this one. I know a lot of guitarists and none of them uses more than 10 pedals. Like the majority of guitar pedal boards, Donner DB-3 is also made at a certain angle so all of the pedals are easily reachable. With the pedal board, you’ll also get a bag and zip ties. The price is around $70, which is a pretty good deal, having in mind its quality, dimensions, and additional accessories. This is a great guitar pedal board for all of you who are really into effects. You can fit around 10 pedals on it, which is more than enough. Despite its dimensions, it is very light and easily portable. G-BONE represent a simple pedal board version. Unlike the majority of pedal boards on our list, this one is not made of metal but of molded polyethylene. Nevertheless, it is still very durable. Have in mind that you won’t jump on the pedal board but rather just gently press the pedals on it. So, if you use it as you suppose to, it can serve you for a long period of time. The dimensions are 23.75″ x 10.25″ x 2″, so it is not a very big pedal board. It is designed for around 5 pedals. You can see that there is a larger surface at the right end of the pedal board. This is where you can put a “bigger” pedal, such as the wah or the volume pedal. Although this is a good idea, I have to say that this can be an issue for some guitarists. First of all, some of you maybe plan to use both the wah and the volume pedal. Besides that, you’ll also have a problem in the case you want to locate your wah or volume pedal at the left end of the pedal chain (this is rarely the case, as usually the wah and the volume pedal are among the first pedals in the chain). Of course, the pedal board comes in a bag. However, that is not all. You will also receive the Gator G-BUS-8 9v daisy chain power supply. This is a great thing because it is not very common to receive a power supply with the pedal board. There are no zip ties, but fortunately, you don’t need any – the pedal board surface is covered with Velcro. The price of this pedal board is around $80. This is a reasonable price, especially when you consider that you’ll get a power supply with it. This is a practical pedal board, intended for guitarists that don’t plan to use more than 5 pedals. The big bonus is that you will also receive a power supply with it. This is a very basic pedal board, no bells and whistles. Made of aluminum alloy, it has a standard look and shape. Luvay pedal board dimensions are 22″ x 12.6″. Although there are pedal boards with similar dimension on our list, this one is a little heavier – it weights 7lb. So, even though it is not the lightest pedal board, the fact that it is heavier indicates that it is also very solid and robust. It has the standard space between bars so that you can put cables there. This means that the pedal board will be tidy and cables won’t bother you. You can easily put around 8 pedals on this pedal board. The great thing is that there is a special spot beneath it where you can keep your power supply. With the pedal board, you’ll also receive a bag, zip ties, and plastic straps to fix pedals to the pedal board. The price is around $60 so it doesn’t defer too much from other pedal boards. 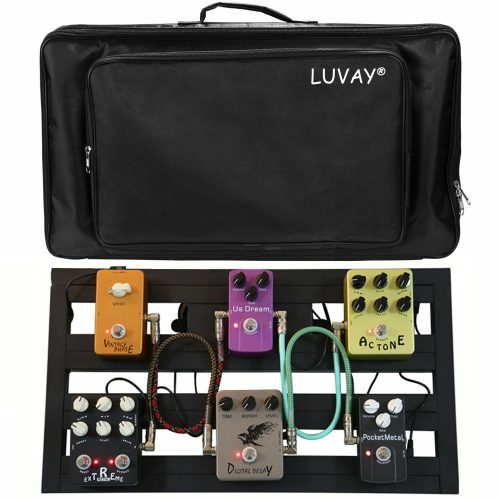 Luvay is a pretty standard pedal board. Although it is a little heavier than the majority of pedal boards on our list, it is not too heavy, so you won’t have problems carrying it around. It is a great guitar pedal board for both gigs and home playing. All of you have probably heard of BOSS. This company makes excellent pedals and processors. However, it also has great pedal boards to offer. The most interesting thing about this pedal board is that it is the pedal board and the bag at the same time! This is very practical because you don’t have to pack and unpack your pedal board every time you go on a gig or a rehearsal. All you need to do is to open the suitcase and that is it! 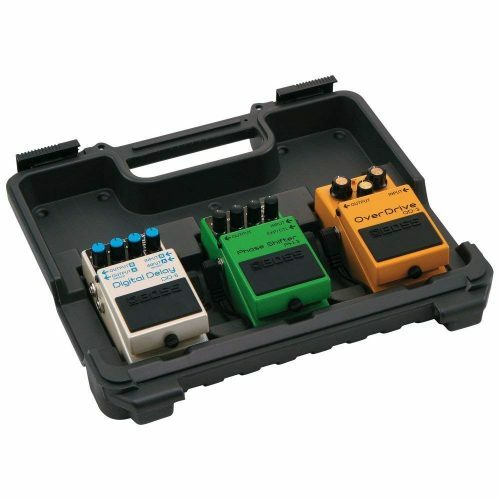 BOSS BCB-30 is made of molded resin, so it is not as robust as pedal boards made of aluminum alloy. However, it is still pretty solid so it can take a good amount of mechanical pressure. Just don’t be too rough on it and you won’t have to worry. Dimensions are 13.6 x 12.7 x 3.5 inches, which is enough for three standard pedals. By standard pedals, I mean any kind of BOSS-like pedals (for example BOSS DS1). Here I should mention one very important thing – there are three molds inside the pedal board, so you can’t put more than three pedals, even if these are small, miniature ones. Also, you can’t put any pedal that is bigger than the standard one. Of course, there is also enough room for the power supply. Besides the pedal board, you will also get two mini cables and daisy-chain cable for power supply. So, just put some pedals and power supply and start rocking! 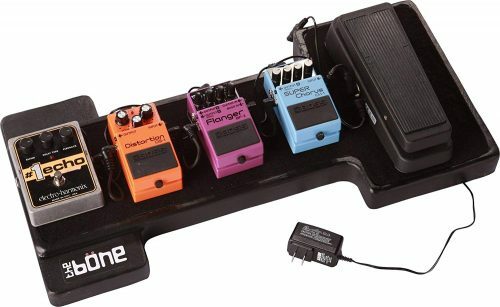 The price is around $52, which is the appropriate price for this kind of a pedal board. Great guitar pedal board for all of you who plan to use pedals with standard dimensions (4.75 x 2.5 inches). It is the pedal board and the suitcase in one, so it’s very portable and practical. This is arguably the most original pedal board on our list. As you will see, it has a lot of interesting characteristics. 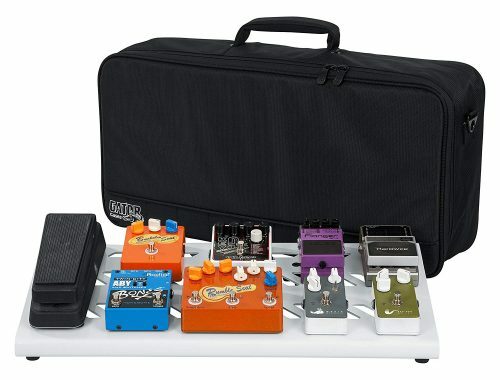 Gator pedal board is pretty spacey (23.75″ x 10.66″) so you can put around 10 standard pedals. Honestly, I am pretty sure that you won’t need more than that. Even professionals don’t use more pedals! It is made of aluminum, so it can basically last forever! Even though it is extremely solid, it is not very heavy (6.4 pounds). This means that it is very practical and gig-friendly. Having in mind that the pedals can be put in two rows, this pedal board is angled in order to ensure the ease of access to pedals. Underneath the pedal board, there is a bracket where you can put the power supply. 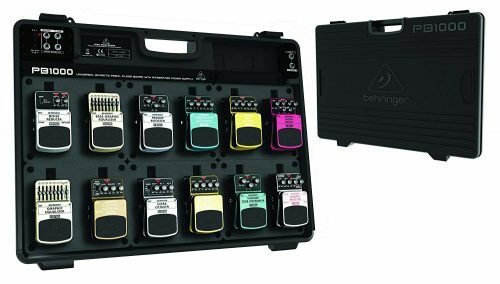 The most interesting thing about this guitar pedal board is the fact that you can choose between different colors. There are five colors available: purple, white, black, orange, and green. How cool is that! 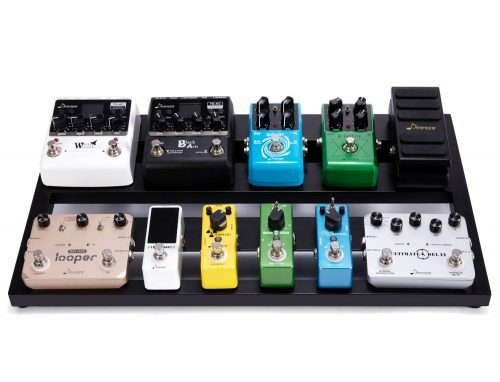 I’ve never seen a guitar pedal board with so many color options, so this is definitely a big plus. 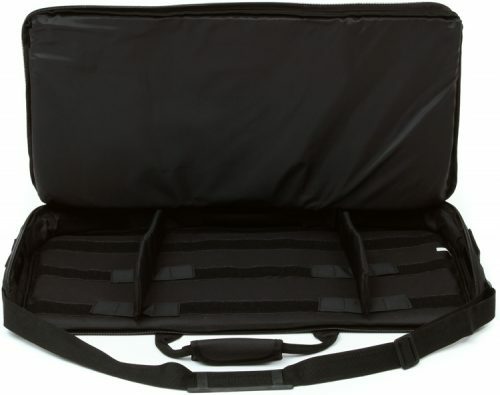 This Gator pedal board comes in a high-quality bag with the removable shoulder strap. Besides that, you will also get adhesive Velcro strips. The only disadvantage of this pedal board is its price – it costs around $150. However, if you can afford it, you will definitely be more than satisfied. Gator is a high-quality pedal board. It has a lot of space and original design. Also, it is built to last. Stagg is truly a great pedal board. It is a kind of a hybrid, as it is both the pedal board and the suitcase. In my personal opinion, this is the most elegant guitar pedal board on our list. It has beautiful chrome hardware and high-density foam padded interior. Besides great looks. this pedal board is extremely solid and virtually unbreakable. Also, it is not too heavy (4.4 pounds), so it is ideal for gigs and traveling. Of course, each pedal board has different price, all in accordance with its dimensions. But besides that, they are almost identical. Since you can put all of the pedals in one line and all of them are easily reachable, this pedal board is in a horizontal position. The price is around $56, which is not a bad deal for this kind of a pedal board. This pedal board is ideal for all of you who plan to carry it around a lot. If you frequently play gigs, you have to protect your pedals, and this pedal board will do precisely that. Also, it is very practical, as you have the guitar pedal board and the suitcase in one item. All of you who are in love with pedals and effect pay close attention to this one! This is the largest pedal board on our list! Behringer PB1000 is a perfect match for all of you that plan to use many pedals and effects. Its dimensions are 4.5 x 26.1 x 19.8 inches, so it can fit 12 standard pedals! You may think “Well, what if I don’t want 12 standard pedals? What if I want to include a wah or a volume pedal?” You shouldn’t worry about this, as Behringer manufacturers have solved this problem. 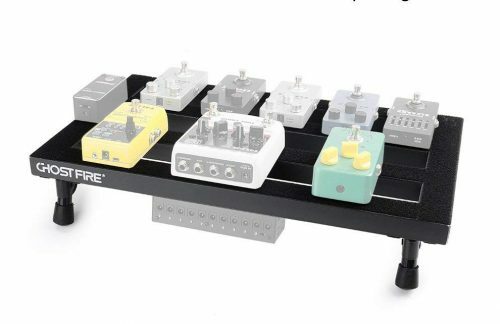 In this pedal board, you have 6 separate platforms with molds on it, so its 2 pedals per platform. The great thing is that you can easily remove the platform and thus, ensure enough space for a pedal with different dimensions. Although it is a big guitar pedal board, it is still very portable, as the pedal board is also a suitcase. This means that you don’t have to pack/unpack it every time you play. Behringer PB1000 is made of plastic, so it is not the most robust pedal board out there. Still, it is very solid and will serve you for many years. Another great thing about this pedal board is that you have 3-year warranty program. So, if anything goes wrong, Behringer got your back! When it comes to accessories, I also have a good news. With the pedal board, you’ll also get a 1.7 A power adapter (including cabling) that is enough to supply all of the 12 pedals! Also, you’ll receive user’s manual, just in case you need any clarifications. Having in mind all that is said, you shouldn’t be surprised that this pedal board is a bit more expensive – it costs around $130. Now, I am aware that this not a small amount of money, but if you plan to use many pedals, this is actually very affordable. Excellent pedal board for guitarists that like to use many effects. With Behringer PB1000, you don’t have to worry about space as you definitely won’t need more than 12 pedals! All in all, this is an affordable, durable, and spacey pedal board. Azor AB-101 is one of the simplest pedal boards on our list. Its dimensions are 18.9” x 4.9” x 1.1’’, so you can place around 4 standard pedals on it. As you can see in the image, if the pedals are smaller, it can fit around 6 pedals. It weighs around 2.4 pounds, so you can easily carry it wherever you go. The material is the aluminum alloy. Considering that this is a small pedal and very solid, it is basically indestructible. Besides pedal board, the package includes adhesive velcro strips and a great bag. The price is very affordable – around $43. This pedal board is perfect for every guitarist that wants to keep things simple and use only a few pedals. It is solid, portable, and doesn’t cost a lot of money. 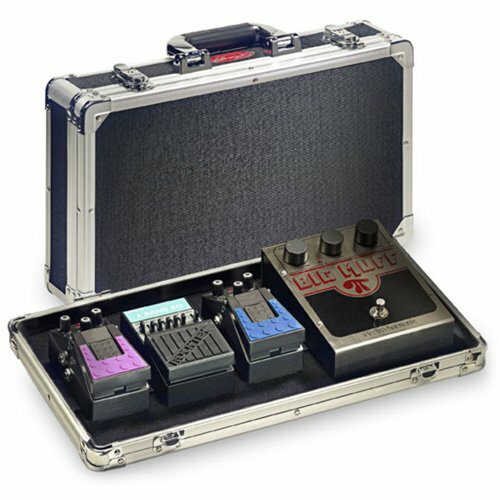 For all of you who don’t plan to use too many pedals and are looking for a small and practical pedal board, I have the perfect thing – Mr. Power. This is the smallest pedal board on our list – 17 x 8 x 3.3 inches. Needless to say that it is also the lightest one (it weighs only 2.2 pounds). This means that is it very portable – you will barely even feel its weight. Having in mind its small proportions, the fact that it is not made under a certain angle won’t surprise you. However, the thing is that you don’t even need an angle, as this pedal board can take only 3 to 4 pedals. So, obviously, you can put all of them in one line and each pedal will be easily reachable. It is made of aluminum alloy, so it is very solid. Except for the bag, there are no other accessories included. Considering the fact that you can only put a few pedals on it, you don’t need many cables and zip ties, so it won’t be a big expense. The price of this pedal board is around $40. It is the cheapest on our list, but its price does reflect its characteristics. If you have just a few basic pedals, this is the pedal board for you. It is as simple as it can be. However, it is very solid and extremely portable, so if you are looking for a small pedal board, this one is for you! I hope that our list helped you to find the right pedal board. We included various types of pedal boards – different dimensions, materials, accessories, shapes, etc. Also, we gave our best to include a wide price range. So, I believe that there is something for everybody! A lot of beginners share the same problem – they are not sure what pedals they should use. This is not hard to comprehend, having in mind that there are numerous effects and pedals out there. However, this is not as complicated as it may seem. We all use pretty much the same kinds of effects – we only defer in how we use them. This is the list of the 5 best guitar effect pedals that you can check out. Here you will learn more about two very popular effects – overdrive and delay. Also, if you are into looper effect, you’ll find useful pieces of information here. However, there are also other pedals that are widely used. Some of the most common ones are the chorus, distortion, wah, volume pedal, reverb, tremolo, compressor, octaver, flanger, and whammy pedal. Let’s take a look at these effects so that you could see whether this is something that you are interested in. The distortion is very similar to the overdrive. It is that “dirty” sound that you can hear in the rock music. The main difference between the distortion and overdrive is that distortion is more “crunchy”. Some guitarist like this sound and other exclusively use overdrive; it’s just a matter of personal taste. Distortion is sometimes used in a very subtle way (for example, blues) and sometimes in an aggressive way (like metal music). There is one important thing that I should mention. A lot of amplifiers have overdrive or distortion channel, so you can activate it just by pressing the button or the footswitch pedal. If you have this kind of amp, maybe you don’t even need the distortion/overdrive pedal. This is one of the most interesting and recognizable pedals. When you think of wah, probably the first song that comes to your mind is “Voodoo Child” by Jimi Hendrix. The intro of this song is a great example of how expressive this pedal is; you don’t even have to play anything, just hit muted strings and step on the wah pedal. If you know what you are doing, it will sound great. What this pedal does is changing and accenting particular frequencies of your tone. By moving the wah up and down, you can create a very sharp and high sound or a sound with a lot of lows. The great thing about this pedal is that it will cover up a lot of your mistakes, especially when you are playing solo. So, if you are a beginner, every solo will sound much better with the wah. Now, don’t get me wrong on this one – some of the best guitarists in the world also use wah very frequently. For example, Kirk Hammett plays almost every solo with his wah pedal. When it comes to clean sound, the chorus is one of the most popular effects. It gives you that beautiful vibe, a wave-like, and almost a hypnotic sound. Chorus uses your original guitar sound and creates a kind of a copy; in other words, it doubles it. The trick is that this “copy signal” is not in a perfect match with the original tone – it differs a bit in terms of pitch and time. This is why the clean signal sounds so spacey with the chorus effect on. Although it is usually added to the clean sound, a lot of guitarists use chorus on the drive sound as well. Here is a list of 10 popular songs with a chorus effect on the guitar, so that you can hear how it sounds within different music styles. Another pedal that we like to add to our tone. This is so common effect that some players don’t even refer to it as the “real effect”. This is also because the majority of modern amps have a reverb effect built in. This means that you don’t even have to buy a reverb pedal if you have this kind of amp. This effect appears everywhere in nature. Ever tried to whistle in a large empty building or hall? That echo that you hear is exactly how reverb sounds. Without it, your tone will be dry and sterile, so be sure to include this effect to your sound. Did it ever happen to you that, while you are playing, some parts of the song are just too loud? Or suddenly, there are too many lows in your tone, so that your amp almost starts to shake? Or vice versa, when you play the solo and want to hold a note for a while, but somehow it just doesn’t have enough sustain so you have to pick it a couple more times? We all have these kinds of problems. Fortunately, there is a simple way to overcome them – just get the compressor pedal. With this pedal, you can set a certain “baseline”, i.e. a particular volume level so that the entire output will have the same volume. This way, everything you play will be heard and noting will be too loud. If the signal is too weak, the compressor ads sustain to it; on the other hand, if the signal is too loud, the pedal compresses it. The great thing is that this does not interfere with your original tone – its quality remains the same. The compressor is most widely used in funk music although the guitarist from all genres like this pedal. Some even use it on the acoustic guitar. As its name suggests, with this pedal you can vary the volume of your output. Now, you may think: “But I already can do that with the volume knob on my guitar!” Well, that is true, but try to do it while you are playing a solo or strumming chords. Now so easy, right? In fact, it is almost impossible. You need the hand for both playing and adjusting the volume. With volume pedal, you can increase or decrease your output at any given moment. A lot of guitarists use this pedal to create that fade-in or fade-out effect. It can be of a great use for the intro or the outro of a song. Besides this, the volume pedal can also be used for dynamic changes. When a song goes down, just decrease your output signal a bit. Also, some guitarists use it as a kind of a boost pedal. When you are about to play the solo or want to boost your guitar riff, just increase your volume. In a way, this pedal is similar to the volume pedal – both of them are changing the level of your output. However, while the volume pedal is an expression pedal, the tremolo is automatic, i.e. you can set its depth, rate, and wave, and once you activate it, it will work automatically. It sounds as if you are muting your signal at the same intervals. If you practiced this with the volume pedal or the guitar knob, they probably wouldn’t be functioning for a long period of time. So, this is why we use the volume pedal. Just by stepping on it, the pedal will produce these short breaks in your signal which sounds pretty cool. Of course, you can manipulate its characteristics – the speed and frequencies of breaks, how quiet the breaks would be, etc. Have you ever wondered why some guitars sound so heavy, almost as the bass guitar? This can be done with the octaver effect. With this pedal, your guitar tone will sound as if you are playing the bass guitar along with it. When you play a certain note, the octaver automatically creates an octave below it. This is why it sounds heavy and full. You can hear this effect in many songs, especially in the rock and metal genre. There are different kinds of octavers. The majority can produce only one octave below but there are some pedals that can provide two octaves below the original tone. Also, some octavers can produce an octave above your original note. The majority of octavers are monophonic, which means that you can play only one note at the time. So, if you try to play a chord, it will sound pretty messy. However, modern octavers can work even in these circumstances. There is an option to limit its activation only to certain frequencies (let’s say, only on first two strings). This way, when you play a full chord, the octaver will only take one or two notes and add an octave to them. This is a very practical option – it is almost as if the bass player is following you by playing the lowest note of your chord. Whammy pedal provides you with a lot of possibilities. It is almost as a combination of different pedals. You can use it in various ways to shape your sound and make it more interesting. Guitarists often identify whammy pedal with its pitch-shifting option. On the right end of the whammy, there is the expression pedal which is used for pitch shifting. By pressing it up and down, you are changing the pitch of your tone. Of course, when you press it down, the pitch goes up and vice versa. Modern whammy pedals have a range of 2 octaves up and as many as 3 octaves down! Besides changing the octaves of your tone, whammy allows you to change your tone to a particular interval of your original note (all from the 2nd to the 7th). This is truly a great pedal. It is so powerful and expressive, that it is often enough to just play one note and step on the whammy and it will create amazing sounds even with this one note. So, you don’t even have to play anything and it will still sound great. Crazy stuff, right? Like the octaver, traditional whammy pedal works best when you play one note at the time. However, new models enable you to change the pitch of the entire chord! In other words, this pedal can modulate the sound of six strings at the same time. You can also perform a famous “dive-bomb” with this pedal. The “dive-bomb” is that decreasing high note that a lot of guitar virtuosos like to perform (for example, Joe Satriani). This pedal can even be used as a chorus. That is right, these new models have a chorus effect build in. However, my favorite feature of this pedal is the drop tune option. 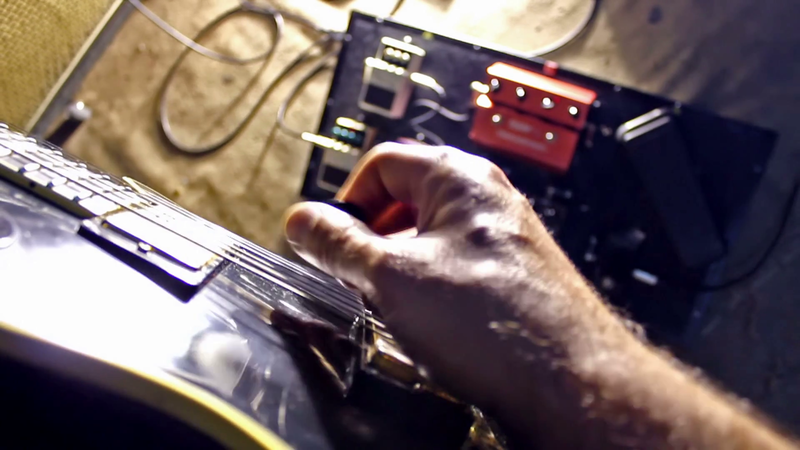 With whammy pedal, you can change the tuning of your output. For example, your guitar is in the standard E tuning. Simply by pressing a button on the pedal, you can change the tuning to the standard D! And not just standard D, but in any pitch you want, all the way to one octave up and down. 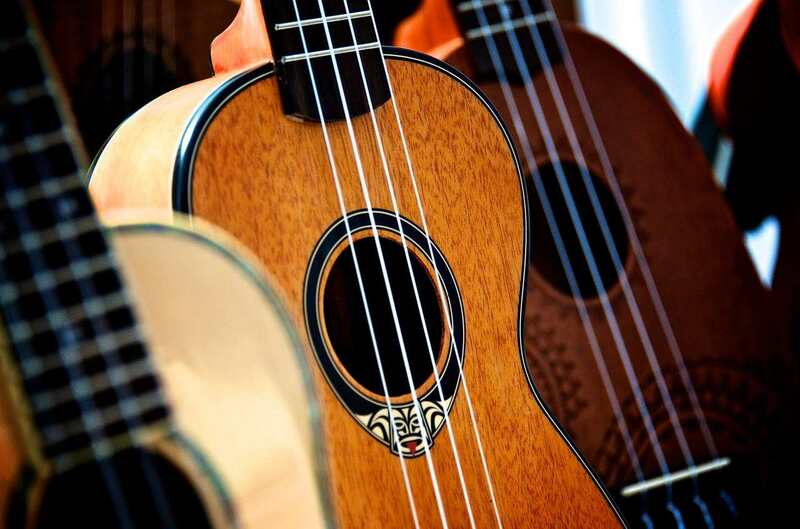 This means that you don’t have to retune your guitar if a particular song is played in a different tuning. When I was a teenager, my band played Metallica and Alice in Chains. The problem was that Metallica’s tuning is standard E and Alice in Chains is in standard D# (or Eb). So, we always had to play all of the Metallica’s songs first, than to make a break in order to retune the guitars, and finally continue with Alice in Chains. With this pedal, we would need just a few seconds to retune our guitars. All in all, this pedal contains a pitch shifter, octaver, chorus, and drop tune option. I should mention something important here. A lot of beginners tend to overuse pedals. Although there is nothing bad in using them, the problem is that this can cause you to neglect your skills. For example, if you perform a “dive-bomb” with your whammy pedal, you may start to think that you actually know how to play it, when in fact, the pedal is doing all the work for you. This is why my advice is to focus on playing per se, and gradually add effects to your sound. This is probably the most common question that I hear from my students. After they got the pedal board and the pedals, the big question is how to arrange them. Indeed, this is a very important topic. The thing is that the pedal order has a big impact on your sound. Of course, the more pedals you have, the more complicated the problem gets. If you have just one pedal, this is not even an issue. If you have two, you can easily try both combinations and see which one you prefer. In the case of three pedals, there are six possible combinations, so you can still handle this problem simply by testing all of the possible solutions. But what if you have 8 pedals? Believe it or not, in this case, you have 40320 combinations! So, obviously, the mentioned method won’t work. But don’t worry, there is no need to test all of the combinations. There are some rules and tested arrangements that you can use as a form of a guide. The most common way is to start with a tuner. Some guitarists prefer to use clip-on tuners, which is the type of tuner that you put on your headstock. However, if you plan to use a pedal, the best idea is to put it in the first position in the chain. This way, the tuner will receive a completely clean tone from your guitar, and thus, will be more precise at registering your tune. Here we come to the most important rule – every pedal affects the following pedal in the chain. Some pedals can affect your tone even when they are not activated. So, the only way to ensure the clean signal is to input your guitar straight into the tuner. When it comes to the wah and distortion, there are different opinions. Some guitarists like to put the wah before the distortion, and others prefer the other way around. I belong to the first category as I keep my wah second in line, right after the tuner. When it is placed before the distortion, wah has a clearer and purer sound. This way you can clearly hear the wah effects. Also, this way the wah is more subtle. When you put the distortion first, you get more aggressive and dirty tone. Why is this so? Well, when you put wah before distortion, the wah actually affects your clean tone and then the distortion is just added to it. If the distortion is first, then the wah modulates the signal that is already distorted, and thus, it sounds more aggressive (some would say muddier). Another reason why distortion/overdrive and wah should be at the beginning of your pedal chain is the fact that they tend to be a little noisy. If you put them at the end of the chain, they can amplify all the noises from all of the other pedals. Some people like to experiment with the wah sound by changing its characteristics. If you are one of those people, I believe that this site can be very helpful for you. The compressor is the pedal that you can see anywhere in the pedal chain as it doesn’t have a usual place. Where you are going to put this pedal depends solely on your personal preferences. As we have mentioned above, this pedal compresses your tone. This is why some guitarists put this pedal in the first place, as they don’t want the compressor to modulate the effect of other pedals. On the other hand, there are players who tend to put it at the end, precisely because they want to compress the entire signal. Personally, I am somewhere in between. I put this pedal after the wah and distortion. This way, the distortion never has a too massive impact and the wah is never too loud, nor does it have too many high notes. The next in line is usually some of the modulation effects. These include pedals such as flanger, chorus, phaser, tremolo, or whammy pedal. When these pedals are placed after the overdrive/distortion and wah, it means that the modulation will affect these effects too. So, if you put chorus after the distortion then you will add chorus to the distortion. If these pedals are put at the beginning of the pedal chain, they tend to have a very small effect. On the other hand, if you put them in the end, they can produce too much effect and overpower all of the other pedals. So, the best idea is to keep them somewhere in the middle. The majority of guitarists put their delay and reverb at the end of the pedal chain. This way, these pedals will affect the entire signal that comes before them and thus, create a more natural tone. 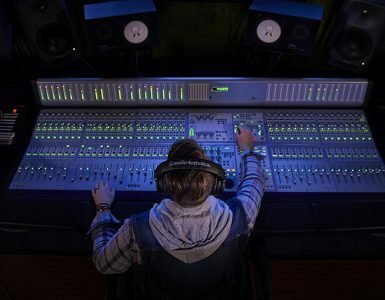 If you put them before the distortion then the distortion would be added to the delay or reverb, which can be pretty noisy and sound artificial. Similar to the compressor, there are no strict rules when it comes to the volume pedal. Again, it all depends on what do you want from your tone. If you want to control the entire signal (including overall volume, distortion level, modulation level, etc.) then you should put this pedal at the end of the pedal chain. On the other hand, if you put the volume pedal in the first position, you will get the same effect as if you are controlling the volume with the guitar volume knob. Now, I have to mention that this is just one of the possible ways to arrange your pedals. Feel free to try different order and don’t be afraid to experiment a bit. If you like the result, there is no reason why you shouldn’t stick to your custom order. As I’ve mentioned earlier in the text, one of the advantages of using the pedal board is that you don’t have to ensure separate adapter for every pedal. It is enough to get one power supply that can be connected to all of the pedals. This way, you don’t just save money, but also don’t need to ensure a lot of space on your pedal board. In order to connect the pedals on the pedal board, you shouldn’t use long cables (like the one you use to connect the guitar to the pedals). If you do this, the pedal board will be extremely messy and it can have a negative impact on your tone. This is why guitarists use very short cables or even no cables at all. You can find just two connected jacks that are perfect for connecting the pedals. Here you can find a lot of different cables that you can choose between. In this article, you could read about the advantages of using the guitar pedal board and learn about some of the best pedal boards available. Also, we talked about the common pedals, the best ways of arranging them and have mentioned the problem of the power supply and short cables. 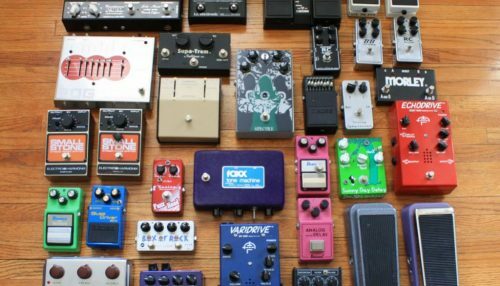 So, if you read this article carefully, you’ve learned everything you need to know about pedal boards. In the beginning, it may be a little confusing – too many pedal boards, effects, ways to arrange them, etc. However, remember that this is completely normal. Every beginner struggle with this. There is really no need to worry – just keep learning and reading about these topics and believe me, in no time, you will become a confident player with advance knowledge and skills. And now, it’s time to start practicing!